Note: For the other Roger Smiths, click here. Or here. We're talking about this Roger. No copyright law in the universe is going to stop me! 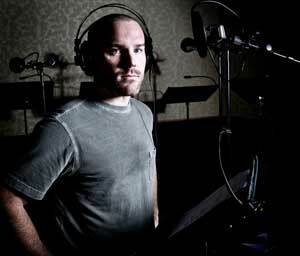 One of the newer faces in voice-acting, Roger Craig Smith (born August 11, 1975) is notable for his extremely versatile range. He can go from downright wacky and high-pitched to serious characters, even to Badass Baritone/Evil Sounds Deep territory. He is currently best known for Ezio Auditore in the Assassin's Creed series while set in Italy, Batman in Batman: Arkham Origins, Captain America in Marvel's animation lineup on Disney XD, Thomas (the college-aged goat intern who turned out to be a Russian spy named Nikolai, not Death's child) in Regular Show, the titular role of Sonic the Hedgehog, starting around 2010, and Chris Redfield of the Resident Evil franchise from 5 onwards. Has a Twitter, and seems to be a big fan of space and photography. Captain Mar-Vell in The Avengers: Earth's Mightiest Heroes! Richard and Hawkodile in Unikitty! Jasper on Be Cool, Scooby-Doo!